One of the most popular and widely used methods, implants are a good substitute for one or more missing teeth. 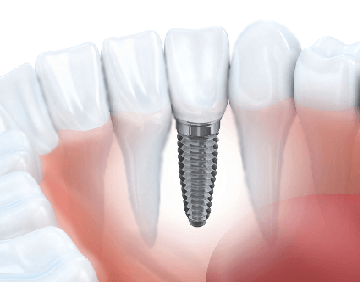 Precisely, this is a surgical process where the implant is positioned in an aperture made in the jawbone that eventually, attaches to the bone and acts as a new "root" for the crown that will be replacing the missing tooth. A crown, also known as a cap is usually designed to look like a natural a natural tooth and attached to the implant. This ultimately, fills the space left in the mouth by the missing tooth. It’s important to understand that for this procedure to be successful it is essential to have enough bone in the jaw that also is strong enough to hold and support the implant. However, unavailability of the same can be taken care by a bone augmentation. Also, natura teeth and supporting tissues near where the implant will be placed must be in good health. You can visit Shah's Dental Serenity for the treatment with the top dentist in Mumbai for dental implants. 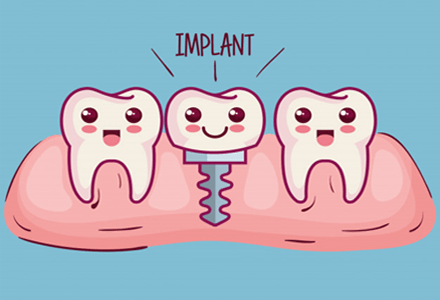 A dental implant covers the area of a lost tooth. An experienced dentist follows this surgical process to carefully position the implant. These implants require necessary support from jawbone in order to stay strong. If not available, a process called bone augmentation is leveraged to provide necessary strength. At Shah's Dental Serenity, we align ourselves with the latest treatment techniques of dental implants. We specialize in dental cosmetics, restorative dentistry, and tooth loss. Experienced and advanced dentistry of our clinic delivers quality results for you. We cover all kinds of advanced dental implants for dental cosmetics, tooth loss and restorative treatment too. Our clinic leverages the best equipment available to make treatment convenient for you. A support staff stays ready to assist you whenever you need. Highly qualified dentists ensure the success of implant surgery. Advanced Facility For Dental Implant Treatments. Our treatment facilities are globally accepted, which makes us a perfect clinic to get your healthy smile back again. We understand your hesitation during the initial stages of treatment. That is why our experts sit with you and explain each and every step of the procedure in advance. This way, you get to make up your mind and conveniently complete your treatment with us. Go ahead; connect with us at Shah’s Dental Serenity for superior quality dental implant done. Dental implant treatment is a great help for without teeth. But conventional dental implant therapy’s biggest drawback has been the length of time required by traditional placement protocols. A 3 to 12 month treatment with multiple surgeries is common. Patients undergoing such treatment have to wait for a long time before they can enjoy the benefits of better appearance, chewing, speech and self confidence. With the technique Permanent teeth in 3 days, all patients can enjoy the benefits of permanent fixed bridges on implants within 3 days. The improvised technique is more reliable than traditional techniques. Having placed several immediate loaded implants. Difficult or hopeless cases are also easily done as the technique is based on basal implants and immediate loading implants. With the help of this technology, we have also treated diabetic patients, smokers and patients with severe gum disease with equal success. Bone buildup procedures are not at all necessary when this technique is applied. With the help of this technology, we are able to treat 98% of the cases in a procedure which has "fixed teeth", as a result within three days. Our technique does not need any bone augmentation, sinus surgery and bone grafts which anyway nobody wants. By avoiding these procedures, the patients get fixed teeth faster and at lower costs. Leaders in immediate implants has helped us in focusing on immediate loadable implants and techniques. With their advanced swiss technology and our years of clinical experience we have almost standardized rehabilitation of edentulous jaws at our centre. The Permanent teeth in 3 days method can often be used to replace a single tooth, several teeth, or a full mouth of teeth, upper or lower, with remarkable comfort, predictability and aesthetics. Other procedures like extractions can also be accomplished at the same time as well. KOS and BCS implant. Single piece implant. Permanent bridge placed in 3 days.